Wise and healthy aging should not be left to the young: it should be practiced, so your RealAge can be younger as you age. New research from Stanford and Harvard’s Schools of Business show that work stress (typically out-of-control hours, out-of-balance work-life ratio, and job insecurity) impact both productivity and health care costs: $190 billion extra in health care costs. Not to mention early death: 120,000 premature deaths. Actually, as a cause of premature death, it is behind just tobacco, poor diet, inactivity, accidents and heart disease, and ahead of diabetes. 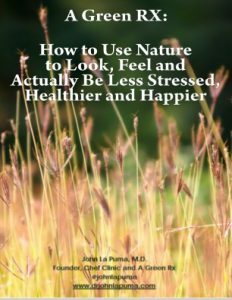 Work stress is seriously handicapping both individuals and their companies, and to say the least, interfering with wise and healthy aging, and how to live healthy. 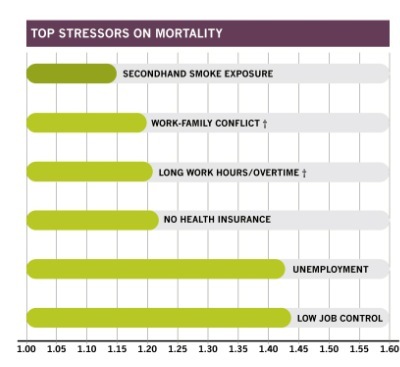 Underappreciated are the actual, day-to-day stressors: work-family conflict and work injustice, especially. It’s not just out-of-control hours or shift work that screws up your psyche, and blood pressure: it’s what your family thinks, and how you deal with it at work. Not surprisingly this is *exactly* what we found when we asked a group of practicing physicians what caused them to overeat the most: eating when stressed, especially when stressed at home and work: these factors were two of the top three in predictors of obesity among this educated, hard-working group. Not surprisingly as well, corporate wellness programs are not necessarily the answer. Smoking cessation, weight watchers (or Refuel) at work, cheap gym memberships, even cafeteria re-design: all nice, all important, but insufficient. More control over time, and more time away to recharge do help. But the real magic is in beginning to build a work environment where people feel prized. Respect, trust, value, endorsement: all go a long way towards engagement in work, job security, and getting home in time for the kids’ game or, even, healthy things to eat, and dinner.